club coach Ashley Knight faced Lee Foster, Matt Baker and Jason Russell. Jason is a UKRB series regular who decided to make the jump to the A grade for this event and he started off well, picking up a game against Ash and winning his match with Lee. However, Matt Baker was out to win it and topped his group without dropping a game. Top seed Mark Fuller was drawn against Christian Turner, Mike Gregory and Tom Temple-Murray. With the absence of Series leader Ted Jeal, this was Fuller’s strongest chance, and whilst he dropped a game to both Mike and Christian, he went into the final after topping his groups with 3 wins. And so it was Matt Baker versus Mark Fuller in the final. Despite a strong display from Matt, it was Fuller who took the match and with it, the A Grade title. This was the biggest grade we have had out of any event all year, with 22 players battling it out. From the group stages, Billy Jones, Natalie Lawrence, Brendon Bennett, Will Peshall, Tim Baker, Andy Jones, Paddy Martin and Ben MacDonald made it through to the quarters. The first quarter final was between Billy Jones and Natalie Lawrence, which Billy Jones won in straight games. The second quarter-final was between ‘lucky losers’ Brendon Bennett and Will Peshall and was won by Brendon. The third quarter-final was won by Andy Jones 2-1 when he faced Tim Baker. The fourth quarter-final was won by Ben MacDonald when he faced Paddy Martin. Billy Jones beat Brendon Bennett 2-0 in the first semi-final, whilst Ben MacDonald beat Andy Jones 2-0 in the second semi-final. Billy Jones had gotten to several finals in the B Grade but had yet to emerge as the victor. He clearly put in all of his efforts and strength for this match though, because he won the encounter 2-0 to win his first ever B Grade title! Again, the women’s draw was really strong in this tournament, with several players contending for the title. 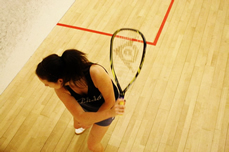 Natalie Lawrence was on top form from her win in this grade in Nottingham last month and she overcame group members Abbie Jones, Siobhan Gartland and Jo Clark without dropping a game. Relative newcomer to the series Rachel Woolford continued with the form that served her well at Nottingham and also topped her group, with two wins out of three against Jo Moseley, Ann Hancock and Karen Bealey. Karen matched her for points, but it was Rachel’s win over Karen that sent her through into the winner’s group. It was number 8 ranked national player Rhianne O’Donnell who topped her group, picking up wins against Caroline Curtis and Liz Cowley. So the winner’s group was comprised of Natalie Lawrence from group A, Rachel Woolford from group B and Rhianne O’Donnell. This was a really tight group and it wasn’t clear exactly who would prosper out of these three women. In fact, it came down to the wire! Natalie beat Rhianne, but Rhianne beat Rachel and Rachel beat Natalie! All three won one out of their two games, but it was Rhianne who picked up a game in her loss against Natalie that saw her lift the winner’s trophy! In group A, Rob Watkins overcame both Jamie Jones and Carl Stokes to find himself with the first spot in the Over 40’s final. Joining him was Paul Brooks from group B, who defeated Brendon Bennett, Alan Voyce and Ian Fudge on his way there. The final was contentious was both players keen for the win. In the end though, it was Rob who was victorious! Paul Brooks topped the group against Paddy Martin and Jerry Thomas to go into his second final of the day after getting to the Over’s 40 final. It was Paul Smith who headed into the final against Brooksy, after beating Chris Hawken and Paul Henderson in straight games. So the final of the two Pauls saw Brooksy have his second opportunity of the day to walk away with a trophy and this time, he would not be beaten. He triumphed over Smith in straight games to take the Over 50’s title. This saw the second a third seed, Roy Burns and Graham Greensall battle it out along with Dave Mudge and Peter Hamlett. Who went into the final came down to only one point; both players had beaten Dave and Peter and so it came down to their match, which Graham won 2-1. The reigning champ Ian Graham faced old rival Dave Manning and Lyn Smith. There was a bit of controversy over who would lead the group, Ian or Dave but in the end it was Ian who won both matches in straight games. So the final was Graham Greensall versus Ian Graham. Neither of these are newcomers to the UKRB series and Ian won the last event at Nottingham. His current form is still really strong and he used it to overcome Graham to take the Over 60’s title. Last year’s event was well contested across all grades with local D+E girl Karen Beeley coming through her group in the B grade before being beaten by club mate Louis Robjant in the final. 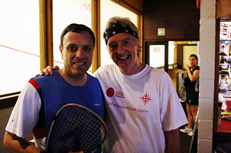 In the Over 50’s racketball veteran Steve Wall once more demonstrated his fantastic control of the racketball by beatingManuel Costa in a very high quality Over 50’s final. It was Costa’s first loss at a UK-Racketball event but this statistic was quickly to be followed by the defeat of another UK-Racketball favourite and winner of the 2010 Series Rob Watkins. Like Costa, Watkins had never been beaten in a Series Event but his experience wasn’t enough to see him through against Jason Russell who battled hard and didn’t give up on a single point. Watkins was heard to say “end of an era” as he left the court but it was also the start of a new one with Russell going on to eventually claim the Over 40’s Series Crown.